Around the Spiral with Edward Lifegem: 3rd Bloggaversary! 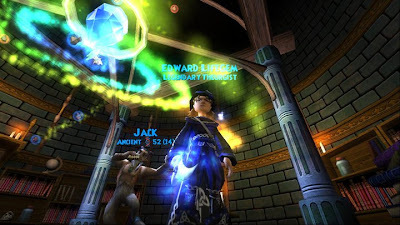 Around the Spiral with Edward Lifegem has been around for three years! These three magical years have been great, surprising and sometimes difficult. Don't worry about it being difficult because this made me way stronger as a blogger and I'm glad I had difficult times to build up this site. I consider this blog one of my biggest accomplishments and this counts as one from real life. I can't believe that I've been blogging for three years, but I'm glad I continue to blog each year no matter what. This is not my last full year of blogging so I will have plenty of more birthdays! This one is a very special one though, I haven't had a chance to thank all of you for all that you do to make this blog. I'm not the only one that creates this blog, you also create it! This blog has provided me with so many adventures and made questing through Wizard101 AND Pirate101 so much fun. I love sharing my adventures on the game with all of you wizards and pirates. I'm guessing ye pirates are wondering how I got started on Wizard101 blogging right? Well it all started, well three years ago lol, and I created a blog with a great friend, Mary Dreamshade. We created our blogs out of the inspiration of other bloggers one of the bloggers including our Pirate101 community manager, Tom Purdue. His blog has inspired so many people to create their own blogs. Thank you Tom (Friendly) for everything that you do! I'm very glad I created this blog I have had so many great accomplishments in the past three years that include: helping wizards and pirates with online safety tips, having more great friends, and official Pirate101 Fansite! Thank you all for helping me accomplish those three things and thank you Kingsisle for accepting this site, I know some of my posts aren't "normal" but hey, I'm not normal :P Thank you for reading this blog, I have many more goals and surprises for the future of this blog and all of you are included. I don't want to make this post too long because I want it to remain special. I'll look at this post years ahead but I won't forget anyone who made this blog happen and continue. Thank you for reading my favorite blog post of the year. Make sure to read my other blog posts from years past to see years first and second bloggaversary! I'll see all of you around the Spiral! Click this image for my first bloggaversary post! Click this image for my second bloggaversary post!